A couple of years ago there were rumors of a pumpkin puree shortage. Having never been a big lover of pumpkin, I immediately felt the need to buy a few cans "just in case." I'm not proud of myself. I'm pretty sure it's behavior like this that caused the gas lines in the 1970s and the run on Cabbage Patch Kids in the 80s. This year, the rumor is that there is a "small fresh turkey shortage." I'm pleased to say that I did not stock up on extra birds. By the way, these muffins were wonderful. Now that pumpkin puree is free flowing again, give them a try! 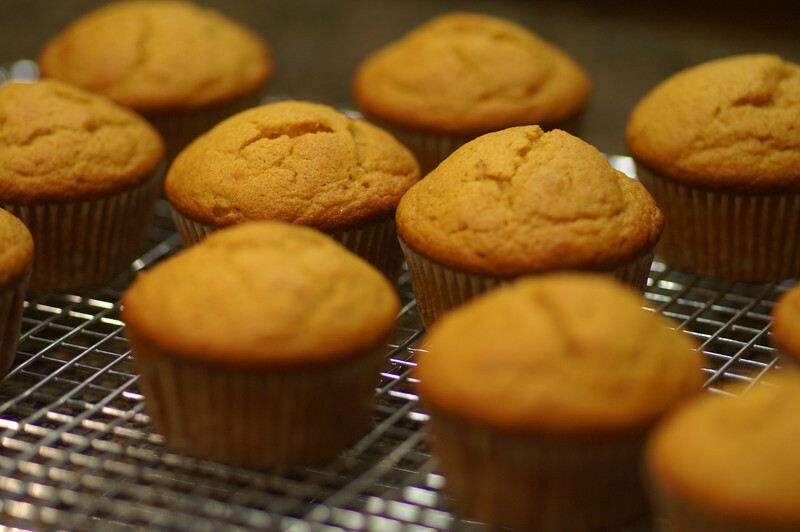 Preheat the oven to 375 degree F and fill 21 cavities of two regular sized muffin tins with cupcake liners. Lightly spray the liners with cooking spray. Whisk together the flour, baking soda, baking powder, cinnamon, cloves, nutmeg, and salt in a medium bowl and set aside. In a large mixing bowl or a stand mixer, beat the butter and sugar for about 3 minutes, until creamy. Add in the eggs, applesauce, pumpkin, and vanilla, and beat until blended. Add in half of the dry ingredients and and mix. Add the juice and mix. Add the second half of the dry ingredients and mix until smooth. Don't over mix. Fill each muffin cup about 2/3 full. Bake on the center rack for 20 to 25 minutes, until a toothpick comes out clean. Allow the muffins to cool in the pans for about 10 minutes, remove them from the pans, and cool on a wire rack. Can be served warm or at room temperature. Recipe slightly adapted from Spices of Life: Simple and Delicious Recipes for Great Health. Ha. I fell for the pumpkin shortage myself; I still have a couple of cans in the cupboard. Your muffins sound quite tasty! I'm glad I'm not alone! I think I still have one can left. Today I went to the store and saw stacks of the stuff. lol.